We all got up at 6:00am (which would soon become known as “sleeping in”), had a quick breakfast, hoisted our backpacks over our shoulders and took off walking down the dusty roads and through the villages towards town. 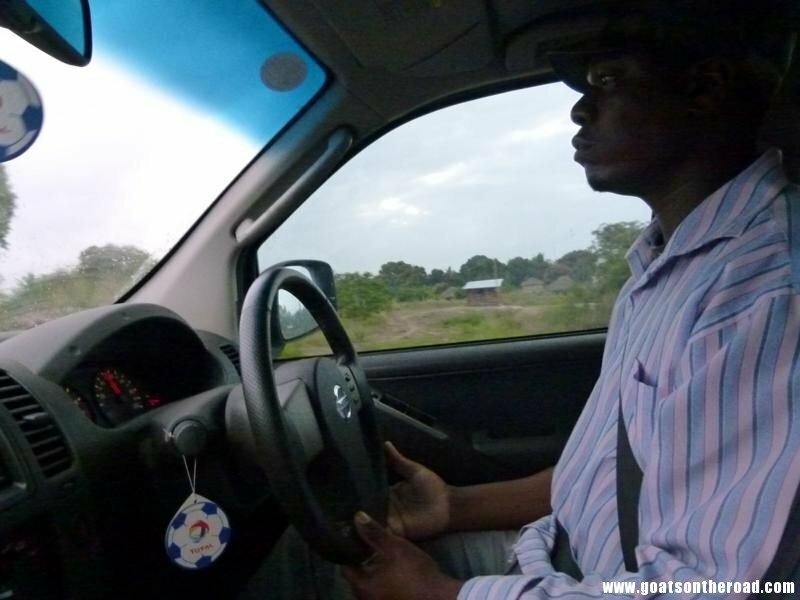 We were heading to Beira and then eventually Nampula. 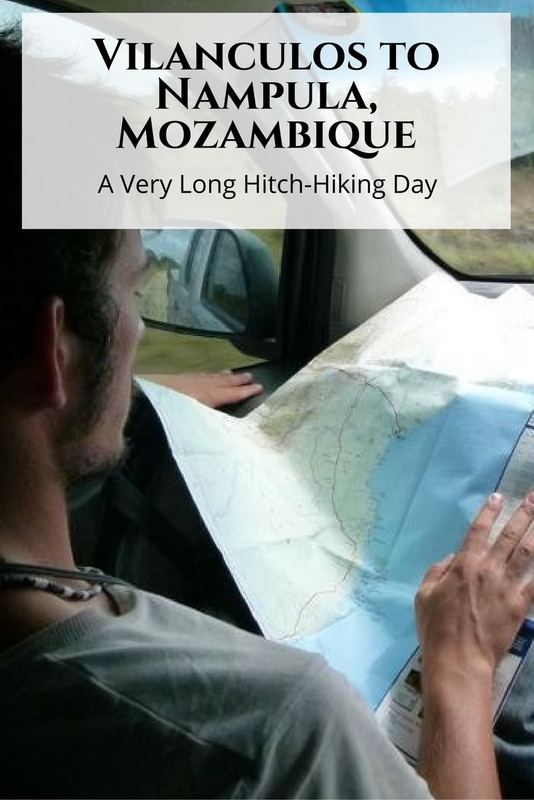 Since the bus timetables in Mozambique are very unreliable and when we ask the locals, they each tell us a different time that a bus is supposedly leaving, we all decided to do as the locals do: hitch hike. We hopped in the back of a pickup truck to take us to the main junction where all the semi-trucks and other passing vehicles come through on their way North. Once at the junction, we all had our jobs: Nick and Henry were talking with each and every semi-truck driver trying to arrange a fair price for the ride, Alice and I took turns watching the backpacks, I was in charge of stocking up on water and snacks for the journey and when needed, Alice would try to translate (she spoke a bit of Spanish which sometimes worked with the Portuguese speaking Mozambicans) and we all took turns holding up our “Beira” sign we had made out of cardboard. 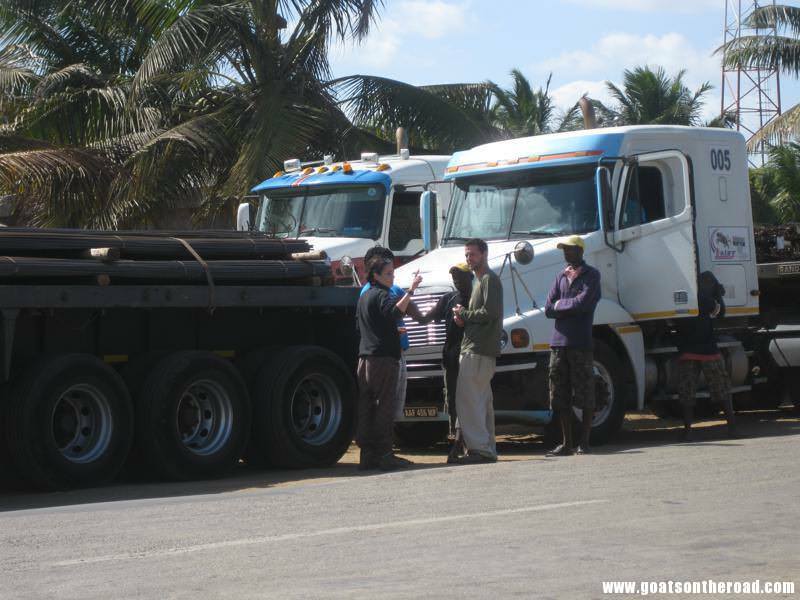 One semi-truck driver had agreed to take us but we then started thinking about what time we would arrive in Beira…semi trucks don’t drive all that fast and it was almost noon by this point. So, we turned down the offer and kept our fingers crossed for a nice, new pick up truck to come our way. Within minutes of turning down the previous offer, a beautiful, 2011 Nissan Navara pick up truck came screeching to a hault when he saw our sign! We all rushed over and were overjoyed to learn that he was not only going to Beira, but he was going to Nampula, which was our final destination. And so began the adventure. The truck was so spacious we had lots of room in the back, it was a smooth ride and everything was perfect. 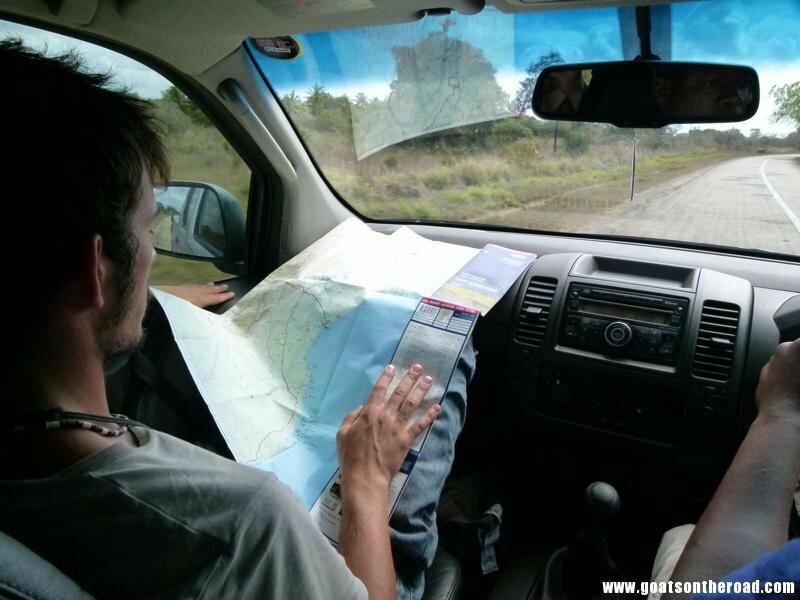 Henry was navigating with his map up front and the three of us were in the back enjoying our snacks. We hit our first police checkstop only about an hour in…this would be the first of 5 along the way. 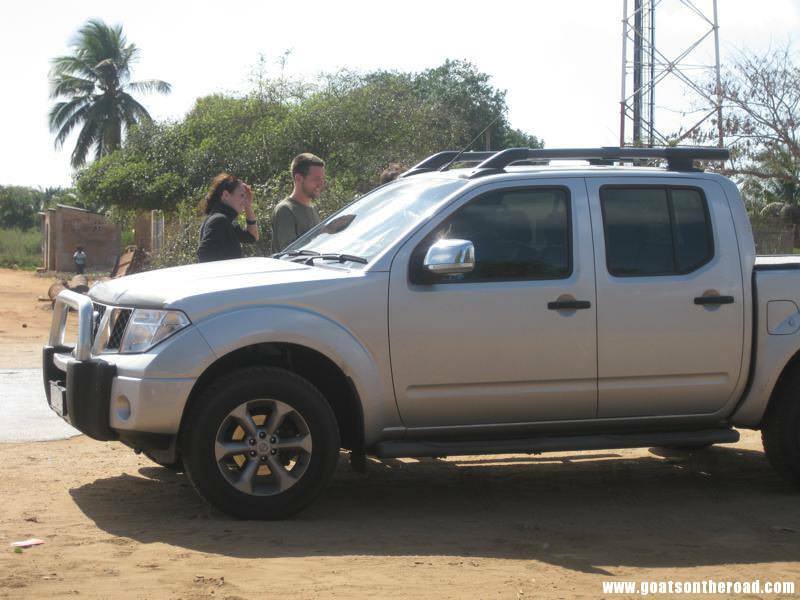 Police corruption is really bad in Mozambique and they pull over anyone for no reason and are looking for a bribe. Especially when they see white faces in the vehicle, they immediately think $$. The first stop wasn’t so bad, he just asked for our passports (luckily Nick and I had a copy made and notarized in the capital city for such an occasion) so we handed him our paper copies and waited for him to ask for something. Shockingly, this policeman just asked us some questions and we were on our way. 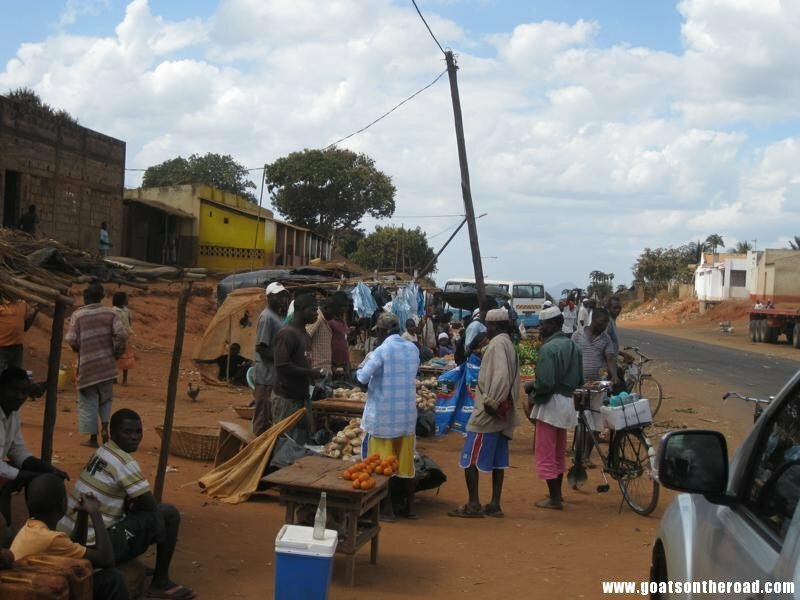 We stopped only once for a quick lunch and then for petrol and other than that we were Nampula bound. About half way into the drive it became apparent that we weren’t going to make it all the way to Nampula in one go. We drove until about 9:00pm that night and decided to spend the night in the very small town of Chaia in a very basic, very cheap hostel. We had a delicious dinner of instant noodles and bread and called it a night. We were getting up at 3:50am the next morning to hit the road early. By day 2 of driving, we had heard the Tracy Chapman, Michael Bolton and Phil Collins albums about 3 times each. I think I know each word to “when a man loves a woman” and “revolution”! Such a random selection of music the driver played. The second day was smooth sailing, only 4 police stops that time and we only had to give away 2 oranges. The policemen were asking us all kinds of questions about how much we were paying the driver for the ride to Nampula, where we met, etc. Butta’s story to the policemen was completely different than mine, Nick’s and Henry’s. When asked what we were paying, we all told the truth and even said that we had paid for his lunch as well as his hotel room the night before. The policemen then wanted money / a cut of what we were paying Butta for the ride. We went on and on about how we’re all students and don’t have much money (which really isn’t lying as Henry and Alice are students) and all we can give is oranges. They thankfully agreed to just take the oranges and in a last attempt asked us for sodas. Butta thought we were all idiots after that! He had told them we were all friends and that he was giving us a ride for free and here we were going on and on about how much we’re paying and all the extra stuff Butta is getting! Oops, I guess that’s just what happens when you’re not used to police corruption and are put on the spot by men with guns. In our defense we were tricked. The policemen said there is no way we’re paying that little amount of money, and made it seem like we were ripping off Butta and were accusing us of lying to them, so we were just defending ourselves, stupidly! I can’t imagine living in a country where there is no one you can rely on for help and where the authorities are trying to take money from the people who don’t have much money as it is. Very sad. We had heard rumours of the policemen asking for tourist’s passports and then saying there was something wrong with their Visa and they would have to either pay up to get the passport back, or, go to the police station. So, that’s why we had our passports notarized, so we wouldn’t ever have to hand over the originals. They had asked for originals a few times but we insisted that the paper copy was fine. Later in the trip that happened to Henry, they took his passport hostage and said there was “something wrong with the visa” and he ended up having to pay them a bribe to get it back…either that or the bus he was on would leave without him. 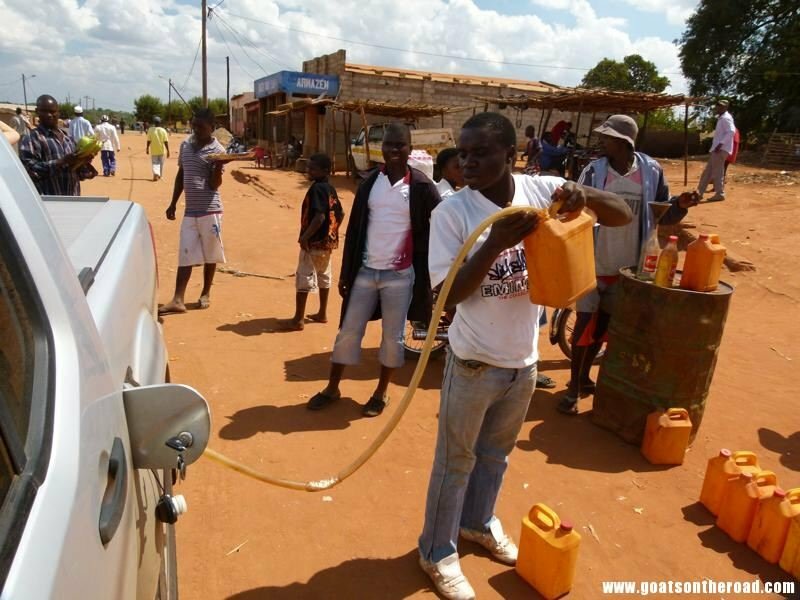 After the police checkpoint, we were very close to Nampula but decided to pull over in a small village to get some petrol. 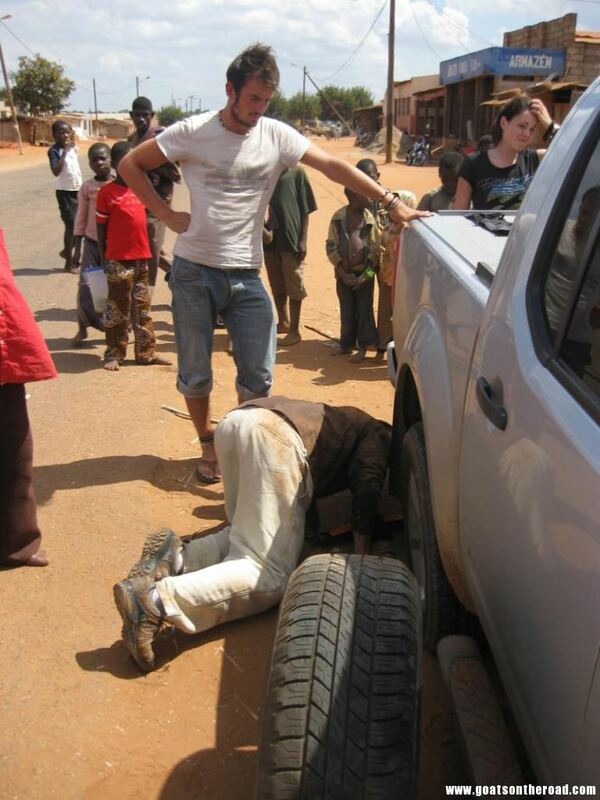 Good thing we did as we noticed there was a flat tire! Great. We all got out, locked the doors, and tried to figure out how to change a tire on a truck. On a car it’s no problem but it even took awhile to figure out where the spare was. I think Butta was relieved we were there with him because he was clueless. Nick and Henry got on their backs and did all the dirty work …while Alice and I tried to avoid the village drunk who was lingering around annoying everyone. After about 28 hours of pretty much solid driving, we arrived in Nampula. It took a little while to officially “arrive” because we had to pick up Butta’s brother, then go to the office where his boss works, Butta had to speak with him, etc. etc. We thanked our new friend over and over for getting us all the way to Nampula…a journey that would have cost us at least triple what we paid him and would’ve taken days and days on very uncomfortable, overcrowded chapas. He was a lifesaver. We were all famished after having only eaten bread and instant noodles for a day and a half and devoured some grilled chicken, stocked up on food for the next morning and called it a night. We all passed out right away in our hotel and were up the following morning at 3:45am to catch a bus to the Northern town of Pemba. As soon as we left the South of Mozambique, getting up between 3:00am and 4:00am would become pretty standard. I don’t know why but that’s when all the buses leave in the North…and there always seems to be only one a day! Hello guys, how are you? Congratulations for your website! I’ve been reading it a lot as Im planning my lonely travel to Mozambique in September. Im gonna arrive in Johannesburg on August the 25th, heading to Maputo right on the 26th. My plane back to Brazil departs on the September 15th. I already bought a flight ticket from Pemba to Johannesburg for the September 14th, due to my tight time… So, heading from Maputo to Pemba, I see that you made it in one month, I’m quite worried if I will have enough time to do so in about 19 days. What you guys think? I`m seriously thinking to buy a flight ticket for this Beira – Nampula route in order to save one day travelling. Please, what would you suggest? Thanks a lot and congrats for the amazing project you are doing! Hey Gabriel, Thanks for the comment. 19 days is still a pretty good amount of time for Mozambique but I would also consider a flight. I would say either hitch hike or fly (depending on your budget) but the public transport would take way too long and be too uncomfortable. Luckily you speak Portuguese so you can probably get near-local prices on public transport, but it’s probably not worth the hassle! If the flight isn’t too much, go for it! 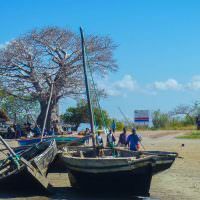 It will allow you to have more time in the beautiful destinations of Mozambique, rather than trying to catch a glimpse from a cramped minivan window. Hopefully this helps, enjoy your trip and keep us updated! Let us know if you find your own way and we can share your knowledge with our readers. Good luck and have fun! Last thing before buying my ticket, I would like to ask how worth it is to spend a couple of days in Mozambique Island. Im asking it because if you guys tell me that Quirimbas is such a phenomenal place, would get a flight directly from Beira to Pemba.. So, more days in Quirimbas or share it with Mozambique Island? Let me know when stopping over in Brazil, will be glad to help you out. Hmmm, tough question! 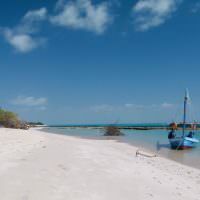 We also loved Moz Island, but not for the beaches, mainly it was chilled out, there was only 1 other tourist there and we wandered around and enjoyed ourselves. But if we had to choose, then we’d definitely say Quirimbas Archipelago – Ibo, Quirimba, Matemo and Rolas Islands in particular! It’s more pristine, has great villages and is just an amazing experience. Well done: only Canadians seem to travel afar and not interpret every negative experience in a xenophobic way! We are also planning travel to Moz, arriving end of July, returning to Canada end of August. We’re staying with a christian orphanage administrator (from Huntsville ON no less) in Beira. Week 2 has us flying back down to Maputo to bus to Nelspruit; from there, renting an SUV for 1 week of Kruger. After that, it’s back to Maputo. We are planning to bus it up to Vilanculos for a 3 day stay. Any suggestions on a snorkeling trip provider? Planning a stay at Casa Jules while there. Your photos and “diaries” are enlightening and genuine sounding. Nicely done! Thanks a lot for the comment! You’re no doubt having a great time in Moz as I write this. Make sure to go out to the islands surrounding Vilanculos for the day. We actually just went with a captain and a crew that we found walking the beach. I’m sure your casa can find a good one for you. We enjoyed a crab lunch, snorkelling and seeing the sand dunes on the nearby island. It was almost a full day, from about 11:00 to sunset. Hi guys, love this read on your blog and very inspiring! I’m actually Canadian as well and I’m expating in Joburg at the moment and have traveled a good chunk of Africa, albeit in 2 week increments. The stuff you are doing really inspires me and makes me want to say to hell with everything and just go with the flow! I’m doing a trip from JHB to Vilanculos in October as a part of a tour with Nomad. The tour turns around and heads back to JHB and but I’m more interested in the less traveled parts of the country so will be heading north to Pemba. I’ll have about two weeks for this leg of the trip and wanted to see if you think I should public transport it all the way (I’ll be a single guy with no portuguese knowledge), or fly for some leg of it? I do want to see Mozambique Island, Pemba, and the Quirimbas (I literally want to do that exact same dhow safari you did) and with what I been reading about Moz’s transportation (or lack thereof), two weeks may be cutting it close to see these things?